Van post-Punk naar Harry Potter naar Star Wars: het overkwam Paul Warren! Medio jaren 90 speelde hij nog in de band Monkey Boy maar eenmaal in de film business kreeg hij rollen in Harry Potter (als weerwolf én hij fungeerde als stand-in voor Daniel Radcliffe) en was hij als Varmik te zien in de kasteelscènes in The Force Awakens. Begin mei kon ik hem namens StarWarsAwakens.nl diverse vragen stellen, onder andere over zijn eigen Funko! figuur! How did you start your career in movies? When I was young, I was very keen on being an actor or a special effects makeup artist. I attended drama classes and appeared in a lot of school plays, as well as making monster movies and action shorts with my friends. When I left school, I actually ended up forming a punk rock band with my brother. We were lucky enough to be signed to an independent label quite early on and for about 10 years we toured Europe to some small success. It wasn’t until I attended an open audition for Alfonso Cuarón’s Children of Men in 2005, where I was cast in a very small role as an injured refugee, that I decided to pursue a career in the film industry. Being on a set, wearing prosthetics and having to perform physically under some quite extreme conditions was a real thrill. In 2006, I was offered the job of Daniel Radcliffe’s body double on Harry Potter & the Order of the Phoenix. I spent much of my time 20ft up in the air on the hydraulic broomstick system and doing other physically demanding activities during the shoot, whilst building a good rapport with the cast/crew and a reputation as a versatile performer. It wasn’t long after that I was recommended to the legendary Stan Winston Studio as a good choice to play a character in prosthetics in The Deaths of Ian Stone. This door opening into the world of acting under silicone and foam latex, is what ultimately led to a film career playing characters in heavy prosthetics and creature suits. 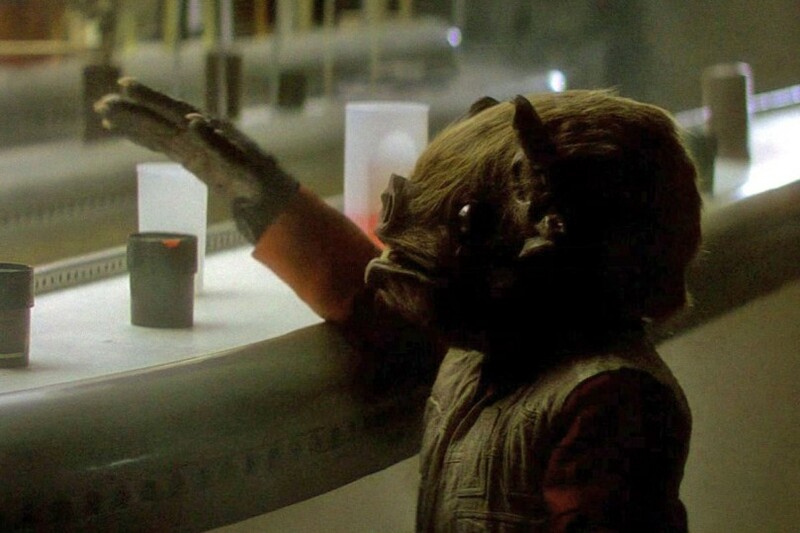 In The Force Awakens you played Varmik, one of the three Hassk aliens. How did you get cast for The Force Awakens and how did you get this specific role? 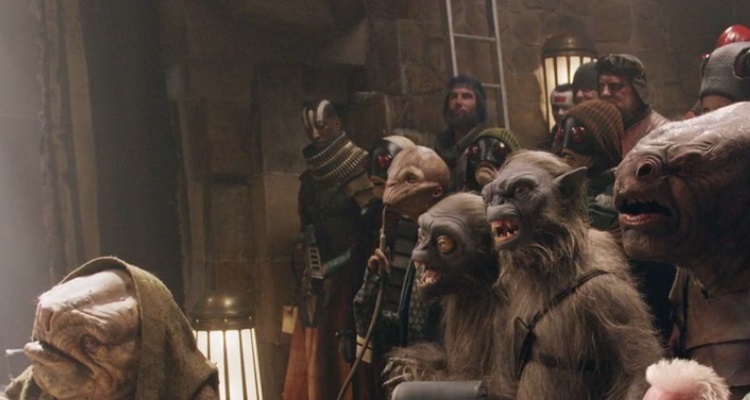 By the time they were casting creatures for The Force Awakens, I had already worked with a lot of the people in Star Wars creature shop on films such as Clash of the Titans, Thor: The Dark World and Guardians of the Galaxy, so I was recommended to Neal Scanlan (creature shop supervisor) and joined a core team they were putting together to perform and puppeteer the creatures. What can you tell about the Hassk costume? Was the head filled with electronics to operate the eyes, mouth and facial expressions for example? Yes, that’s exactly right. There was a creature crew member off to the side of the set, looking at a monitor, operating the eyes and the snarl, while I operated the mouth opening with my chin and of course the body movement. The costume was made very similar to Chewbacca’s costume. I wore a woollen suit with hand punched hair, which was very hot, but beautifully made by the creature department. A lot must have happened on and off the set of Maz Kanata’s castle. Could you share some good stories? So many great memories. I wouldn’t be able to do them justice in just a few lines. But what I will say is, that if you are a Star Wars fan, working on and being in a Star Wars film is everything you think it will be. Your character was one of the first Star Wars creatures illustrated by Ralph McQuarrie 40 years ago. I bet you are aware that a ‘werewolf-like’ creature is on the Mos Eisley painting he did for the first Star Wars? Yes, Varmik is based on that classic Ralph McQuarrie cantina concept art. J.J. Abrams loves that image and wanted to bring the character to life, so it seemed a natural fit for me to play, as I bear a somewhat physical resemblance to that character’s body. 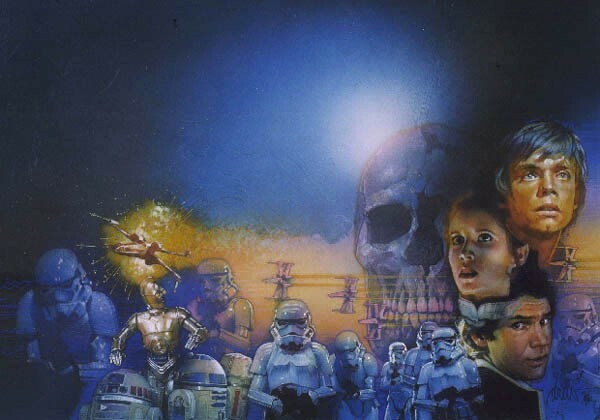 It’s quite ironic, because that cantina art has also always been one of my favourite pieces. I couldn’t quite believe it when I was asked to bring that character to life. It’s still very surreal to me and hasn’t quite sunk in. Since you knew about the concept art I bet you were a Star Wars fan before you got cast? Yes a massive fan. I’m very lucky and grateful I was given the opportunity. Varmik has got his own action figure and there’s a Funko Pop figure of him. I’m sure you have both of them, right? I have both and I love them. I’ve played quite a lot of creatures in my career, but this is the first character to get his own toys. I never expected it would be Star Wars toys! Every month there seems to be something new about the film coming out and with the recent release of the Blu-ray, which features more Varmik behind the scenes, I don’t think I’m ready to look back just yet. It’s still on-going. Besides Star Wars you’ve worked as a double in Captain America, X-Men: First Class and Harry Potter. What are –in your opinion- the differences between working on these movies and on Star Wars? The fundamentals of making the film are pretty much the same. You get up early, you work really hard and you want to do the best job for the director that you can. It’s challenging, very exciting and a lot of fun. But this is Star Wars. It’s so iconic in pop culture and film history, that it transcends everything. Final question: you were in in post-punk rock band called Monkey Boy. Who were your musical influences and will your band perform again in the future? We were big fans of late 80’s and early 90’s post rock bands like Minor Threat, The Birthday Party, The Jesus Lizard, and The Jon Spencer Blues Explosion. That kind of stuff. I don’t know if we will play again. We have talked about it and we are all still very close, but we all started new chapters in our lives…maybe. Thank you for your time! Let’s end this interview with a good track from the Monkey Boy album The Creature of Doctor Rumpledink called Strutter!